Can You Afford R10 per Week to Save Lives? to buy that airtime or expensive disposable nappies, formula, and whatever else is needed by our Little Fighters and their Families. Spreading Awareness about Childhood Cancer wherever we can because awareness is vital for early diagnosis and early diagnosis is the difference between treatment and remission or suffering and death! NO request is too small or too big – we try with all our might to do whatever we can to make life just a little bit easier for these Cancer Warriors and their families. For as little as R10 per week, you can help the Little Fighters Cancer Trust provide targeted, individualised and practical Support to Children Fighting Cancer, and their Families. As incongruous as it sounds, after 4 years we have only 54 subscribers to our SMS line. The R10 donation per week is deducted from your airtime/account, so you really will not even miss it, and it would help us SO much, so please, would you not consider signing up? We promise to make your day every workday by sending you a great inspirational quote at 10 o’ clock every morning. Constantly having to ask for funds is soul-destroying and takes up time that we could be using to much better effect – helping our Little Fighters and their Families. If even 50% of our 12,589 Followers joined our SMS Line we would garner around R200 000 per month, which will go a LONG way towards what we need to do what we do. Let’s just put this into perspective, shall we…. What can one buy in South Africa today for R10? WOW!! 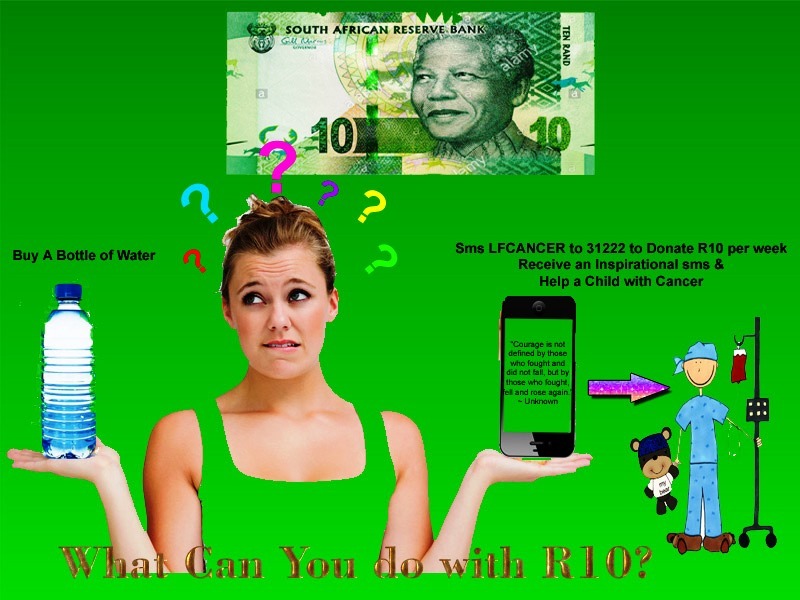 According to the above, the only thing one can get for under R10 is a bottle of water – we can put that R10 to much better use by supporting Children with Cancer and their Families. Sms LFCANCER to 31222, and your R10 weekly donation will be deducted from your airtime/ account. You will also receive an inspirational sms every weekday, to start your day off on a positive note.